Have you been trying to get your child to play cricket, but he is too scared to face the ball? Are you looking for a simpler and less scary way to get him interested in the sport? 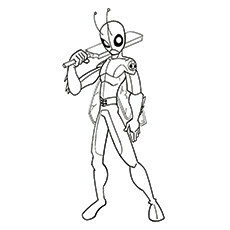 Why don’t you try our cricket coloring pages to do the trick? Read this post for some fun and interesting cricket coloring pages for your kids. Cricket is a sport that originated in southern England in the 16th century. It became the national sport of England by the end of the 18th century. The expansion of the British Empire contributed to its popularity overseas. Cricket is popular in England, Indian subcontinent, Southern Africa, Australasia and West Indies. Now that you know a brief history of cricket, it’s time to check out some cricket coloring sheets for your cute little batsman. 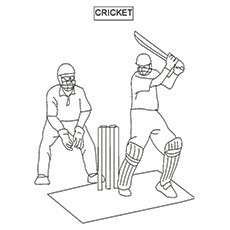 Here’s a cricket coloring sheet featuring a batsman and a wicket-keeper. The game of Cricket is played between two teams consisting of 11 players each. You get points by running between the cricket pitch, which is known as a run. Each team takes turns at batting in an attempt to score runs, while the other team fields. The turn is called innings. Meet Jhulan Goswami, an all-round cricketer playing for India’s Women’s cricket team. Jhulan is the fastest women bowler in the history of cricket. She routinely bowls at speeds above 120 kilometers per hour and recorded a top speed of 135 kilometers per hour. The BCCI has appointed her to lead the upcoming world cup tournament. 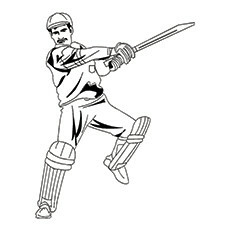 Here’s a batsman cricket pictures to color. 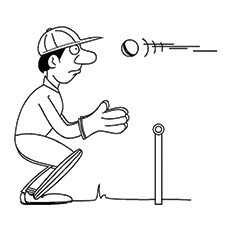 The bowler delivers the ball to the batsman and batsman hits the ball away from the field to score runs. The batsman continues playing until he is out, and the team continues batting until all the ten players are out. Here is a coloring page of an exciting cricket match. Cricket is the second most popular sport in the world with over 120 million players worldwide. The length of a cricket match ranges from just 20 over to five days. The International Cricket Council and Marylebone Cricket Club maintain the standards and rules of cricket. 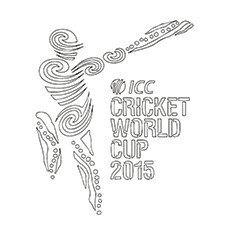 This coloring image features the logo of ICC Cricket World Cup 2015. New Zealand and Australia hosted the tournament jointly from 14th February to 29th March. Out of the 49 matches, Australia hosted26 games and New Zealand 23 games. Australia emerged the champions this time again. It is their 5th World Cup title. Are you feeling dreary? Then this cricket coloring page will surely cheer you up. It features a goat playing cricket. 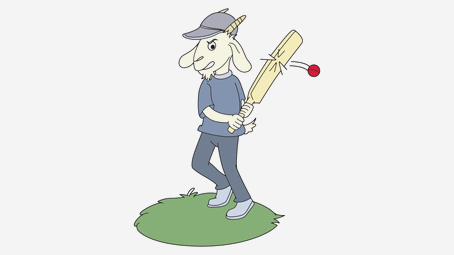 Playing cricket with a goat can be very tricky. You never know where it can hit the ball. But it’s going to be fun anyway. Have fun coloring this page featuring a cricket playing cricket. Now that’s some serious wordplay. Tell your child to add some fun color to this alliterative cricket scene. Ask him if he can come up with some alliterations of his own. 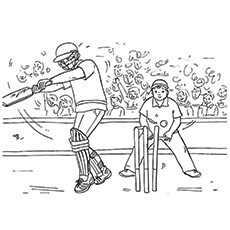 This cricket coloring pictures features a wicket-keeper about to dismiss a batsman. A wicket-keeper stands behind the stumps or wickets and stops the deliveries from going for four. He can also dismiss the batsman in various ways, the most common being out. A wicket-keeper may also wear a helmet with a mesh guard to protect his face from injury. 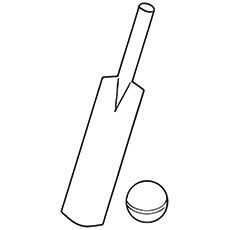 The diagram features the two most important equipment used in a cricket match- a ball and bat. A cricket bat is a willow-wood, flat fronted blade, with a candle handle. The length of the bat cannot be more than 38 inches. A cricket ball is a solid and hard ball consisting of cork covered by leather. 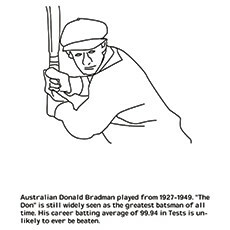 Here is a cricket coloring sheet of Sir Donald Bradman, the greatest test batsman of all time. His meteoric rise from a nobody to top dog in the Australian cricket team took just two years. The Don scored at a level that made him worth three batsmen to Australia. Donald Bradman has an average strike rate of 99.94, which is the highest for any batsman. He is a legend in the truest sense. 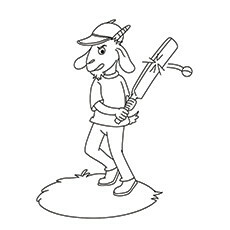 We’re sure your child will love our set of cricket coloring pages. Please let us know which one he enjoyed coloring the most. Leave your comments below.